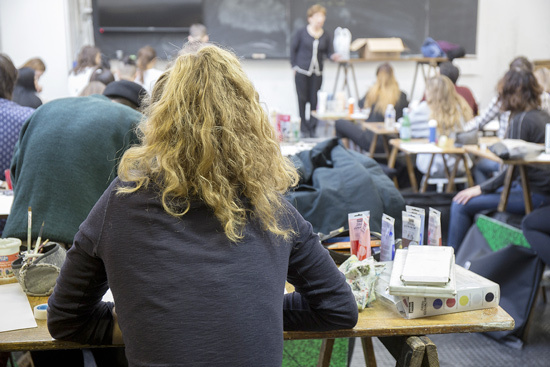 The first academic year gives students an opportunity to develop their passion for art and design. For creative jobs within the different range of different design fields, it is highly recommended that students have creative imagination, an inquiring mind, artistic awareness, strong work methodology, vocation and motivation. Divided into three art workshops you will be encouraged to exchange achievements and work together to develop creative ability. Our teachers and lecturers ensure regular monitoring and give support and guidance to help you succeed according to your career objectives. From the very beginning of the first year, all the basic design fundamentals and artistic techniques are studied. Thanks to a system of on-going assessment put into place throughout the academic year, projects are regularly evaluated and graded. 25 hours master class and 25 hours of personal work each week. 8-hour art workshop and 3 hours of personal work each week. 1-hour master class, 2 hours of practical work and 6 hours of personal work each week. 3-hour art workshop and 3 hours of personal work each week. If you would like to apply for the 1st year study program at Penninghen please fill out the applications form. This form provides a list of all the required documents, an administration document, internal regulations of the school and contract.There is no pre-selection process.